“Cloud computing” promises myriad benefits — including cost savings on technology infrastructure and faster software upgrades — for users ranging from small startups to large corporations. That’s an auspicious future considering that not everyone agrees on exactly what cloud computing is or what it can do. “Cloud computing refers to a number of trends related to pushing computing resources — hardware, software, data — further into the network,” said Kartik Hosanagar, a Wharton professor of operations and information management who moderated a panel discussion on cloud computing at the 2009 Wharton Business Technology Conference. These days, no computer user is an island. A recent study determined that 80% of the data used by business comes from outside the company. Cloud computing “is the technical response to this reality,” said panel participant Anthony Arott of anti-virus software company Trend Micro, based in Cupertino, Calif.
Lynn suggested that true cloud computing isn’t simply about adding physical distance between the user and the computer that’s doing the grunt work. What’s new is “when you abstract the computer from the physical resources.” In other words, you no longer have specific machines — no matter where they are located — dedicated to specific functions or software applications. Instead, you have a piece of software running across a pool of machines, making optimal use of all the available hardware resources. In between these explanations of cloud computing lies a variety of products and services, all of which claim to offer a number of advantages — lowered investment in hardware, more efficient use of computing systems in existing data centers, easier scale-up of the applications and services. These approaches are now possible due to faster and more pervasive communications. As bandwidth has become cheap and readily available, and transmission speed is no longer an impediment, it’s possible to store data and run software anywhere for users to access from wherever they want. According to Prasanna Krishnan, an associate at Menlo Park, Calif.-based venture capital firm Draper Fisher Jurvetson and also a panelist at the Wharton conference, the easiest examples for most people to grasp may be consumer web applications such as Microsoft’s Hotmail, Google’s Gmail and YouTube, and Yahoo’s Flickr photo-sharing service. Consumers run only their browsers on local computers. The rest of the software — along with users’ email messages, photos or videos — are on remote machines the user can’t see and doesn’t have to know anything about — as if hidden in the clouds. Google extended its successful webmail model by introducing Google Docs — online versions of word processor and spreadsheet applications, software that traditionally runs on users’ PCs. It is joined in that market by others, including Zoho, of Pleasanton, Calif., which offers a suite of online collaboration and business applications. These convenient online tools have helped to fuel the market for netbooks — lightweight portable computers which contain minimal data storage and computing capacity, and carry price tags usually under $400. By taking advantage of online applications and storage, users have the option to spend less money on hardware. Reducing — or eliminating — hardware and other operating costs naturally also appeals to corporate users, many of whom are moving toward subscription-based “software as a service” (abbreviated SaaS). Online business applications offered by companies such as Salesforce.com (for customer relationship management) and Workday (for human resources and financial software) can not only replace expensive programs that would run on companies’ premises, they can reduce the need for corporate computer servers and the related costs of maintaining them. With SaaS, companies pay subscription fees for usage rather than licensing costly enterprise software. SaaS is a growth industry: A new study by Forrester Research concludes that even in the current recession, software-as-a-service providers are seeing double-digit growth in their subscription revenue. Ariba, a Sunnyvale, Calif.-based procurement software-as-a-service company that had been left for dead after the Internet bubble burst, saw a 73% jump in its subscription revenue, from $18.8 million in the third quarter of 2007 to $32.6 million in the same period in 2008. Other companies have expanded into the cloud by offering data-center resources as more generic “computing as a service.” Google, which maintains vast warehouses of servers to run its own software applications, also offers a service called Google AppEngine that allows businesses to develop and run their own programs on Google’s servers. Amazon has a similar offering called the Elastic Compute Cloud, or EC2. These services offer companies a place to host applications and data under a pay-for-usage model — called “utility computing” because it is ready on demand, just like turning on the lights or the water faucet. Customers pay by unit of consumption, whether it’s storage space or computing time, and can scale usage up or down quickly. These computing services are particularly attractive when companies want to develop and test new applications without interfering with existing systems, and they can offer “hot,” or ready-to-use, backups of the applications in use. The notion that a company has a “private cloud” on its premises might seem contrary to the concept of cloud computing, but cloud-like features can also have advantages in corporate data centers. Lynn from 3tera gave a historical analysis of how computing architectures evolved. Decades ago, he said, “you had a giant mainframe, and everything ran on it. If you ran out of capacity, you would either make it bigger or get another giant mainframe.” Then, client/server systems came along to distribute processing between central computers or servers and the PCs at users’ desks. Still, however, every machine in the data center had to be dedicated to a specific software function or application. The newer technology of virtualization permits one piece of hardware to act as multiple “virtual machines” and be dedicated to multiple functions. This makes more efficient use of hardware, but each virtual machine still must be dedicated to a specific software function. “What cloud computing really changes is [that] now you don’t have specific machines, or virtual machines, dedicated to specific functions. You have a pool of machines. Anything can run anywhere” — even in a company’s private data center, Lynn said. Traditional corporate data centers can be inefficient. Businesses equipped for peak workloads may have servers that are underutilized much of the time. In a private cloud, a group of a company’s existing computers can be brought together as a computing pool — and an application “can just grab any available hardware and then give it back,” said Lynn. “The term we use is ‘disposable information technology infrastructure. '” The software from 3tera acts as a conductor, parceling out components of an application to different computers in a cloud like a taxi dispatcher. “There is no architectural reason why you can’t have 20 different machine types” involved, Lynn noted, although performance is optimized if the machines are similar. For some corporate users, keeping the cloud in-house alleviates the security and privacy concerns that can come with running key applications and data outside the company. 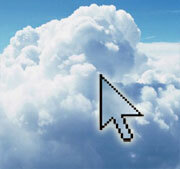 However, cloud providers insist that data is safer and less vulnerable with them. Companies that provide storage and computing services maintain state-of-the-art facilities and implement security updates immediately. Panelists at the Wharton conference encouraged students in the audience to take advantage of cloud computing as entrepreneurs. Those thinking of offering innovative online services — in the hopes of becoming the next Facebook or Twitter — will need a way to ramp up their capacity quickly if all goes well. With a cloud-based service, expansion capacity is as close as you can get to unlimited, panelists noted.